Don’t wait until we’re toast! Cut your CO2 Now! Science Art-Nature, based in Palo-Alto, California, plugged in the CO2 Toaster for an online art exhibit held in conjunction with the annual meeting of the Pacific Region of the American Association for the Advancement of Science (AAAS). The animated CO2 Toaster widget is one of 38 artworks selected for exhibit as examples of Science Art. The widget was designed to be an engaging and memorable tool to track CO2. It is a creative collaboration by artist/author Franke James, designer/programmer Bill James, and Michael McGee, creator of CO2Now.org. The CO2 Toaster always shows the latest monthly data by pulling NOAA data for atmospheric CO2 from the Mauna Loa Observatory in the United States. The code can easily be added to most websites or blogs. Why is tracking CO2 important? The 38 images included in the 25-topic exhibit will remain online as part of Science Art-Nature’s mission to raise the prominence of Science Art and the benefits of combining the accuracy of science with the evocative power of art. The exhibit helps to communicate the benefits of Science Art by informing viewers about nature and encouraging the sustainable use of resources. Science Art Categories: The 35 categories included Atmospheric and Oceanographic Sciences, Organismal Biology, Ecology, Anthropological Approaches to Environmental Change, Materials Science and Nanotechnology, Computer and Information Sciences Link, Education, Agriculture and Horticulture, Ecotoxicology and Environmental Protection. Participating Artists: Bev Abbott, Chris Augusta, Carel P. Brest van Kempen, Martha Brouwer, Pery Burge, Kelly Dodge, Christophe Drochon, Lori Dunn, Ulco Glimmerveen, Franke James, Bill James, and Michael McGee, David N. Kitler, Martin Lasack, Liz Lee, Terry Miller, Robert Mullen, Rick Pas, Patricia Pepin, Teri Power, Jennifer Rodriguez, Edward Rooks, Judith Gebhard Smith, Jim Turanchik, Darryl Wheye, Ria Winters, Floy Zittin. 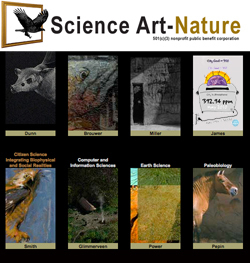 Science Art-Nature is a nonprofit organization founded by Stanford University scientists, Don Kennedy and Paul Ehrlich, artists Tony Angell and Darryl Wheye, and nonprofit consultant Pamela Meadowcroft. It has launched an online Science Art exhibit with the generous support of Artists for Conservation (AFC) Center for Conservation Biology, Stanford University (CCB) National Audubon Society Stanford Institute for Creativity and the Arts (SiCa) and an anonymous donor. The exhibit features artwork relevant to the research presented at the AAAS Pacific Division meeting, “The Art of Science,” Ashland, Oregon, 13-17 June, 2010.